Tim and Jeni Buchanan at their vow renewal in Paris. A father of the bride completed a major life milestone—dancing with his daughter at her wedding in Costa Rica—and died of a heart attack minutes later, People reports. Tim Buchanan's daughter, Michelle Howard, hasn't spoken out about the loss, but his family and loved ones are rallying together to pay tribute to him and give support to the family he left behind. 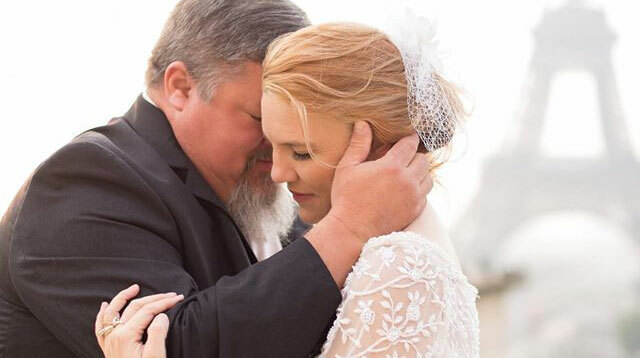 His wife, Jeni, wrote on Facebook that Tim was so excited for his daughter's wedding that he "ignored his body telling him something was wrong" and avoided going to the doctor. She hopes that people take away the message that you should always "take care of yourself and your loved ones." "He was the most beautiful soul I have ever known and I will never be the same without him," Jeni wrote in a separate Facebook post. "I know he loved me and our family." The 54-year-old had worked as a detective at the York County Sheriff's Office in South Carolina, according to HeraldOnline.com. Funeral arrangements are still in the works, but loved ones and police officers will have a private memorial service Sunday, and deputies are wearing black bands around their badges in his honor. A friend of the family has started a GoFundMe campaign to raise money to help Jeni take time off from her job as a wedding photographer. The campaign has raised more than $11,000 in just one day.